Home/Blog, Document Scanning/We Love Scanning. Love is in the air this Valentine’s Day!! 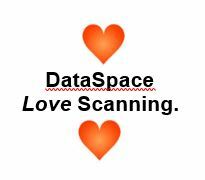 DataSpace provides a wide range of Scanning Options Nationwide, we have multiple hi-tech scanning suites that are situated within secure buildings and facilities. The combination of DataSpace scanning equipment, software and experienced scanning operatives means that we can scan even the most challenging of documents – whether they are delicate, fragile or in poor condition. DataSpace operate to the highest levels of security and are accredited to the following standards – ISO9001:2015 Quality Management, ISO/IEC27001:2013 Information Security Management, BS10008:2014 Legal Admissibility & Evidential Weight of Electronic Information, PD5454:2012, ISO14001:2004 Environmental Management System.